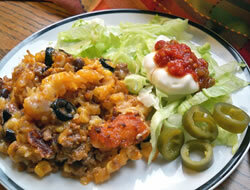 Mix together ground beef, Rotel and soups in a bowl. 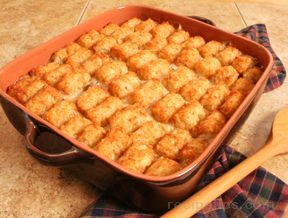 In a well greased 9 x 13 pan, put baked tater tots in first. Then add ground beef mixture. 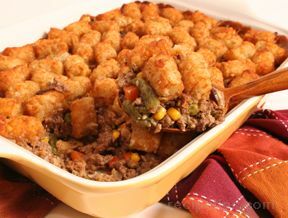 Spread evenly over tater tots. Add cheese on top - as much as you desire. Bake at 350 degrees F. for 20 minutes, uncovered until cheese melts.